Video: MAN OF WAR: Sean Parnell. 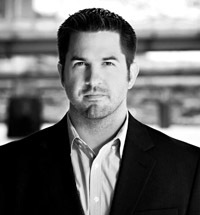 Sean Parnell, a U.S. Army Airborne Ranger and New York Times best-selling author of Outlaw Platoon: Heroes, Renegades, Infidels, and the Brotherhood of War in Afghanistan (William Morrow), served in the legendary 10th Mountain Division for six years, retiring as a highly decorated captain. Parnell has received two Bronze Stars (one for valor), and the Purple Heart. He is a renowned Afghanistan Policy Expert and has been featured on FOX News, CNN, MSNBC, NPR, SiriusXM, and numerous other media outlets. While deployed in support of the Global War on Terrorism, Parnell led one of the most valorously decorated light infantry units in Operation Enduring Freedom history. For 485 days he and his men, nicknamed the Outlaw Platoon, experienced some of the most brutal fighting in the Afghan War. The perfect keynote speaker for schools and colleges, community events, veterans' organizations, and corporations, Parnell tells the story of 16 months of combat, and the love, brotherhood, and faith that saved him from a most terrible fate. When Parnell's platoon of 40 soldiers was given the task of rooting Taliban insurgents out of a mountain valley along the Afghan-Pakistan border, they thought they would be facing a ragtag bunch of armed civilians. But that was a conviction that almost got them killed. On May 7, 2006, what started out as a routine patrol through the lower mountains of the Hindu Kush turned into a lethal ambush. After barely surviving the enemy's attack, Parnell's men realized that they were facing the most professional and seasoned force of light infantry the U.S. Army had encountered since the end of World War II. The Taliban were well-trained, creative, and cunning, and they did not lack in courage. They showed unusual tactical skill; they had studied U.S. military communication patterns and knew the U.S. military's equipment and its capability -- as well as its severe limitations. What followed was 16 months of continuous combat in which Parnell's platoon killed over 350 enemy combatants without causing a single civilian casualty. But the cost of battle was high for his men: over 80 percent were wounded in action, placing their casualty rate among the highest since Gettysburg. Parnell's men earned 32 Purple Hearts, and were deployed longer and saw more combat than any other platoon since the War on Terror began in October 2001. Parnell's experience as a leader in such a high-stress situation as combat has resulted in a unique perspective on teamwork, brotherhood, the importance of selflessness in not just war but in everyday life, and just how much we all take for granted, something which he explores and explains in his sought-after presentations. He lives with his wife and two children in Pittsburgh, Pennsylvania. 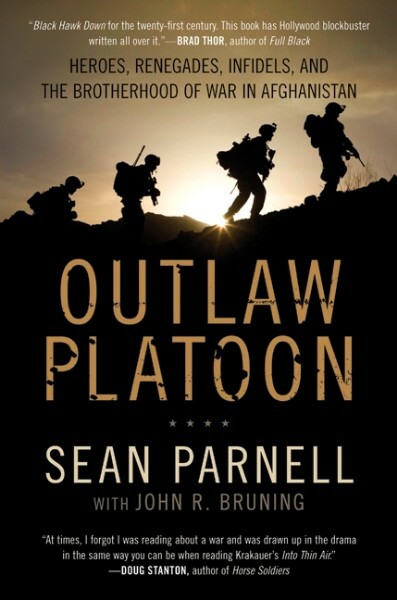 "The range of emotions that Sean Parnell summons in Outlaw Platoon [is] stunning. A nuanced, compelling memoir ... Parnell shows he's a gifted, brave storyteller." "Outlaw Platoon put me back on the battlefield again. It's a heartfelt story that shows how very different people can be thrown together in combat and find a way to make it work. Parnell and the soldiers who fought beside him are all courageous heroes -- real bad asses." "Outlaw Platoon is a detailed and utterly gripping account of what our soldiers endure on the front lines of America's war in Afghanistan -- the frustrations, the fear, the loneliness, the nastiness, the occasional rage, the difficulties of finding and identifying an elusive enemy. Here, in these pages, are the on-the-ground realities of a war we so rarely witness on news broadcasts." "This is a story of genuine emotion and drama. It's been a long time since we've seen a narrative that so accurately describes the bravery, loyalty, and character of America's warrior sons. Sean Parnell and John Bruning's Outlaw Platoon is a soulful story of men at war, but more importantly, it shows us that the love and brotherhood forged in the fires of combat are the most formidable qualities a unit can possess. And that the maturation of a natural leader -- Sean's own story -- is one that we will never grow tired of reading. I can see many fascinated readers for this book -- men and women, in the military and without, on the front lines and here at home." "Two of the grittiest, most intense tales of courage and camaraderie under fire I own are Black Hawk Down and Lone Survivor. I now have a third, Outlaw Platoon. It's Black Hawk Down for the 21st Century. And an absolutely gripping, edge-of-your-seat ride detailing the men of Outlaw Platoon and the day the fates foolishly attempted to stack the deck against them. This book has Hollywood blockbuster written all over it. There is much more to Outlaw Platoon than just its guns-blazing action. It is an epic tale of leadership, heroism, and the bond among warriors who ply their deadly trade with deceivingly simple mandate -- to kill the enemy and return home together alive. An absolute must read!"